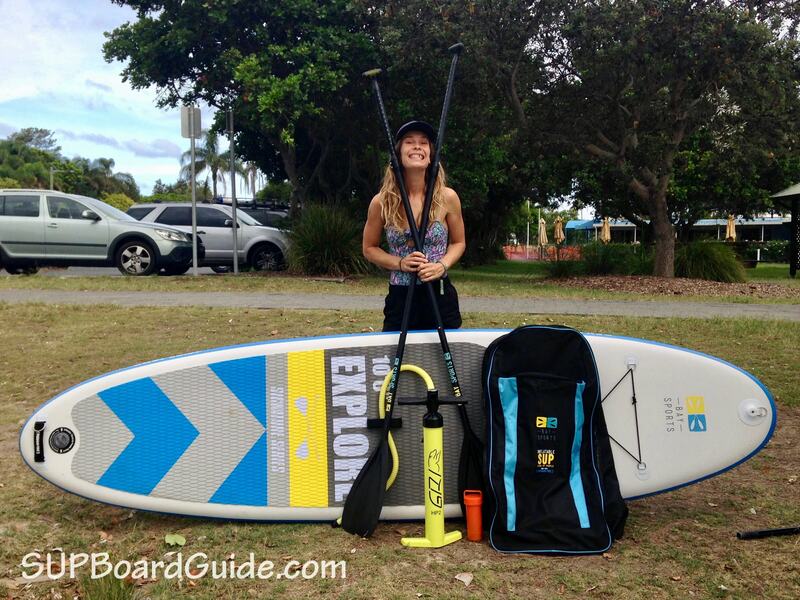 Do you consider yourself a savvy SUP shopper? Want to know your purchase is worth the $$$? Something that floats your boat (pun intended) and bay-eautiful? Bay Sports won’t be doing much ironing if they keep producing SUPs like this though! 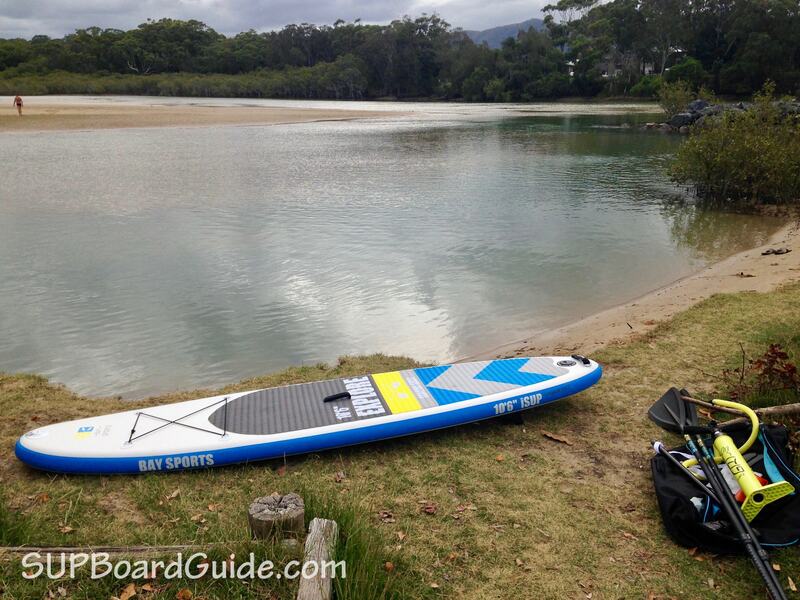 Read on below to find out about why this ultralight but tough as nails paddle board is for you. It may be the high-quality accessories that sell you! Or the cool features like molded plastic fins and the delightful color schemes. Either way, whatever it is that hooks you in, you’re in good hands purchasing with Bay Sports. We value honest and informative reviews. So we’ve taken the time to cover all the features. Which includes performance and materials and taking the Explore out in various conditions. What you’ll find below is an accurate account of where the SUP excelled and where it didn’t. If you aren’t entirely sold after paddling the 10’6″ Explore for a few minutes, I think you may have something wrong with you. This is a dream SUP to paddle. Thanks to the combination of materials, design and the high-quality included paddle. I had the chance of paddling the Explore around in some winds, going against a current and in the choppy river mouth. I didn’t take it out in the waves, in the end, the surf was big that day! Calm river paddling, I found the board to pick up speed. It powered like a salmon upstream against the current. At first, I was a little skeptical about 5” thickness. Having paddled inflatable SUP’s below the 6” thickness mark before and felt as if I were to sink, it’s a reasonable query. Though, I have no complaints about the Bay Sports. I would put it down to the manufacturing, which I’ll go into more in the materials. If you are beginner taking the Explore out, you’ll love how easy it is to handle. The tracking was on point, and the rigid body makes for no issue of stability. At 32” wide I even was able to do some headstands and practice some SUP yoga without a worry. Comfort levels were soaring too with their quality deck pad. You’ll find it easy to turn, both standard paddling in circles or pivot turns. The tail pulls in enough for tight turns without completely sacrificing on stability. Being so light (again – details in materials) but still rigid, will have you dancing SUP circles around your friends in no time. There isn’t a huge amount of rocker in the nose. I’d say that it would struggle a little in waves but on the smaller days, you’d still get some fun out of it. The body being a little bit thinner means it cuts through the waves easier, making getting back out not so arduous. When I experienced chop in the water, I was reassured by my stable platform I wasn’t going to be risking becoming a shark snack. It didn’t waiver, and the paddle stayed strong, keeping my stokes consistent which helps with your balance. I would like to see the option for it to be used as a single fin. As that does really up the performance when you’re cruising or taking that leisurely paddle. Looove the options. So you have four choices for color schemes. They are modern, bright and appealing. You’ll find one that you like no matter what you prefer. The pink/blue is a standout, where if you are feeling a little shy, the navy/orange is probably a better choice. Not only are the designs standouts from the usual SUP prints, but they are also done in a way to ensure they stay looking as crisp as the day you bought them. When it comes to quality, long lasting products, it’s not the makeup that matters. It’s what’s inside that counts. I sound like I’m giving relationship advice now, but perhaps there’s a crossover here! 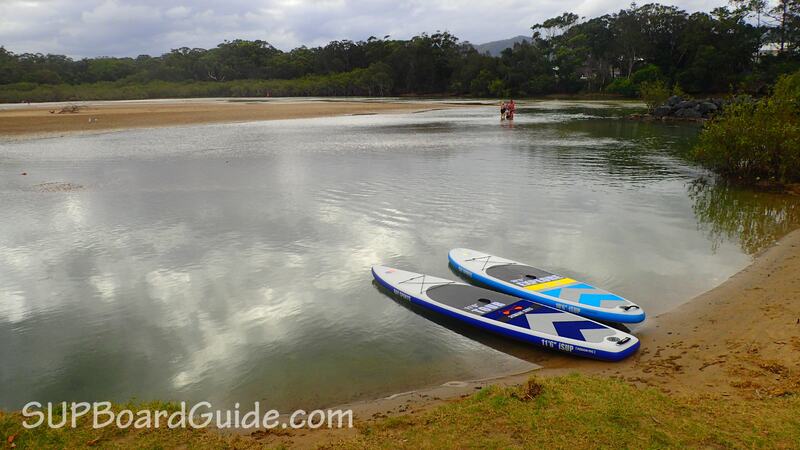 To the untrained eye, it would appear inflatable SUPs are all much the same except for the obvious shape. There is lots going on underneath the surface though. 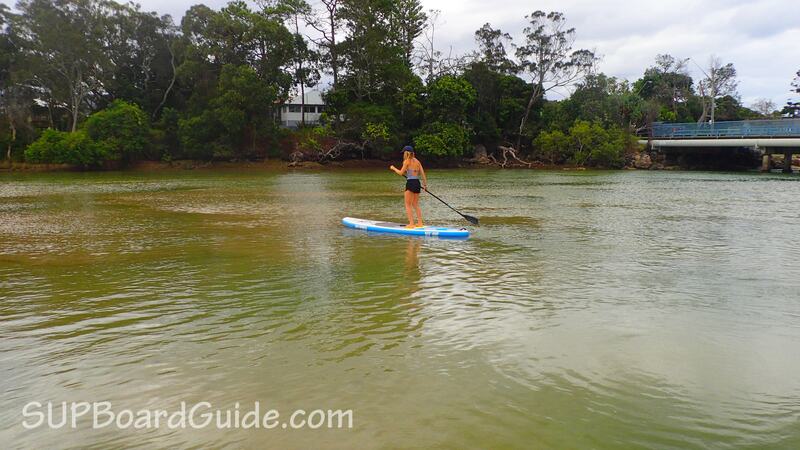 It defines whether your SUP will be a one season wonder or long-lasting romance. 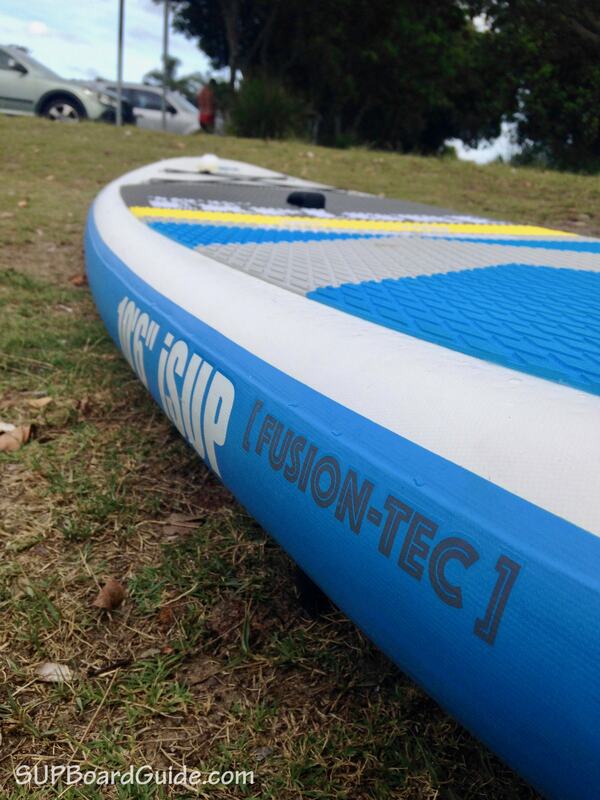 Bay Sports utilizes a fusion technology. It eliminates weight but doesn’t sacrifice rigidness or durability. You see other inflatable boards being made with double or triple layered PVC hand glued together. 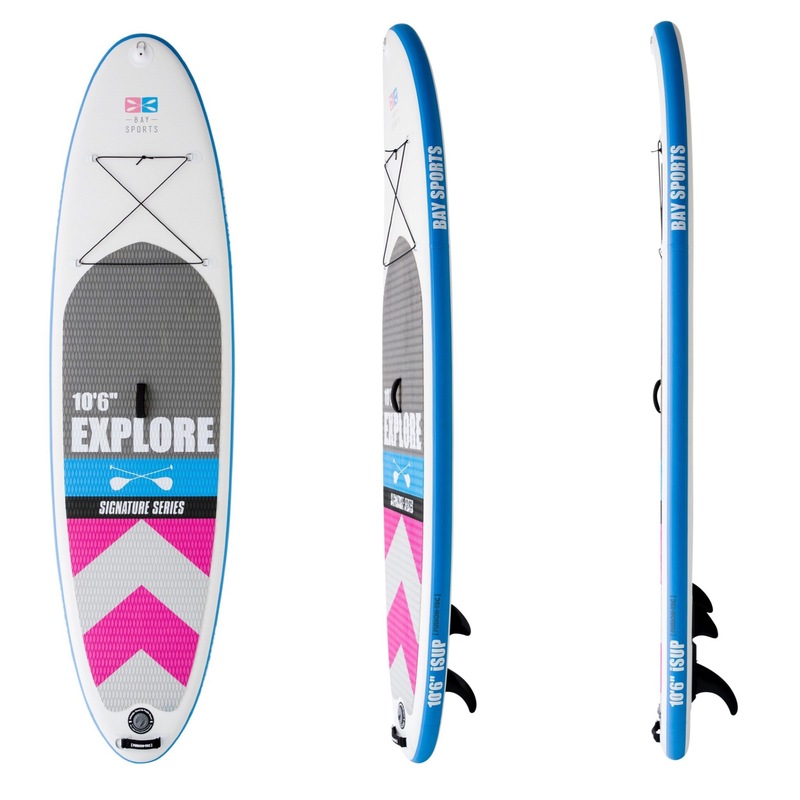 Bay Sports chooses to directly fuse their layer to the drop-stitch core of the SUP. It’s a slightly more costly production but increases the overall product tenfold. The drop stitch core is a fancy way of saying that the inside of this board is built to last. Drop stitching refers to the method of joining layers with indestructible threads. They then only strengthen as they expand (as you inflate). Inflatable SUPs use drop stitching to separate themselves from pool toys. By eliminating the need to reinforce with many layers, Bay Sports also has brought their board’s weight down significantly. Even your children can carry your SUPs for you. But don’t tell them I told you that. Though the added layers on top and bottom aren’t necessary, reinforced walls are still a great idea. They are what cop the biggest beating, so Bay Sports reinforced their walls three times over. Another benefit of these materials is the longevity. Poor glued together SUPs will start to peel back at certain seams or around places like the valve. This can lead to leaks and ultimately the death of your SUP. Sometimes this happens as quickly as one week use. Bay Sports has put a huge amount of research into their manufacturers. Doing so before they went ahead with their products, it means you’re getting the best of the best. How do I know? I had a good ol’ chat with Bay Sports about the materials. Why? Because we value honest and truthful reviews here at SUPBoardGuide! 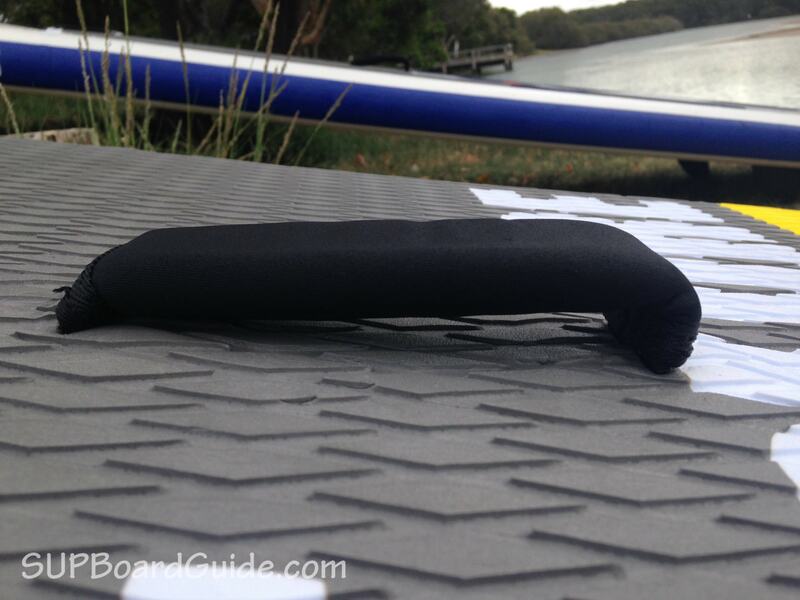 Another test and trial for Bay Sports was finding a decent deck pad. For 2 x SUPBall Premiership Winner and Bay Sports owner Hamish McMinn, it was imperative to use a high-grip yet comfortable deck pad, so the decision was made to opt for a Diamond-Grooved EVA deck pad across the range. So they’ve gone with their signature Diamond-groove EVA deck pad, and it’s paid off. You’ll feel like you’re walking on clouds. I did a bunch of headstands as well as practiced my pivot turns, and I rated the deck pad 10/10 for comfort and grip. To add to the comfort, you’ll be able to bring along any necessities. Things like water bottles, extra clothing, can all be stored under the bungee cord that is connected to the board by 4 D-rings on the nose. I also find it helpful to store my paddle under there when I’m pretending to be a pro at SUP yoga. When I received the Bay Sports to test out, the fin box system being used was the US Air 7 Fin Box system. It works with the FCS connect II toolless fins too. The fin supplied to you on your purchase of the Explore is easily inserted and held in place by a screw plate and screw. This all applies only to the removable center fin, the two fixed side fins are made from molded plastic. 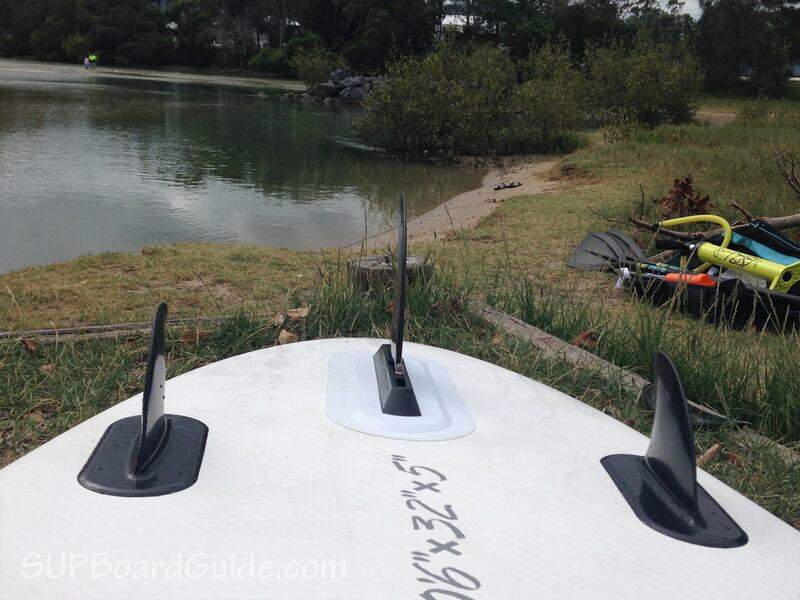 The side fins bend when you roll up the board, which can be a shock for some when they first open their SUP. 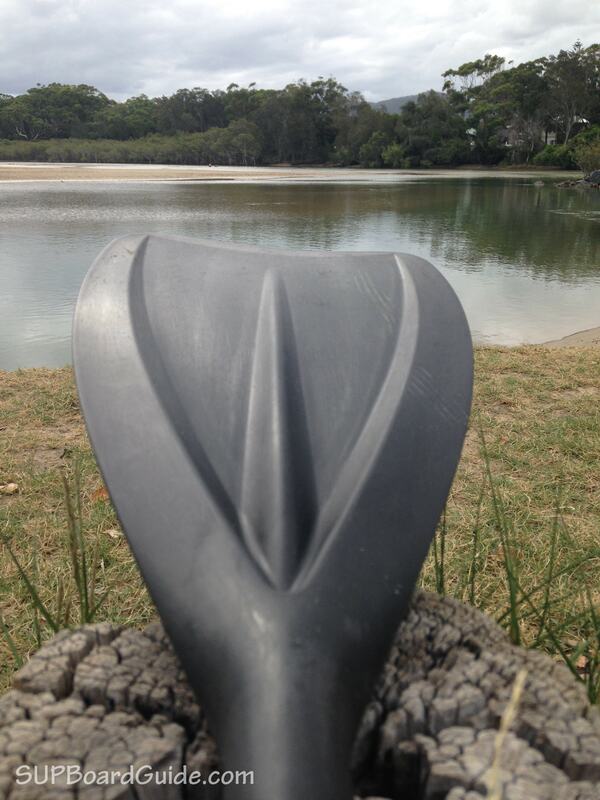 It helps protect the fins being able to flex when rolling your SUP up or being in the shallow water. You either just need to leave them in the sun to re-shape or if they are particularly bent, throw some hot water over them first. At the time of this review, they supply you with a 7” fin that needs the screw and plate. From here on out all Explore SUP’s will come with the 9” Glass Flex Connect II fin. Which means no screws and a 2-second insertion! Having a good quality pump like the one Bay Sports includes always makes the inflation easier. It’s high-pressure and dual action to get the biggest whoosh for your pumps. 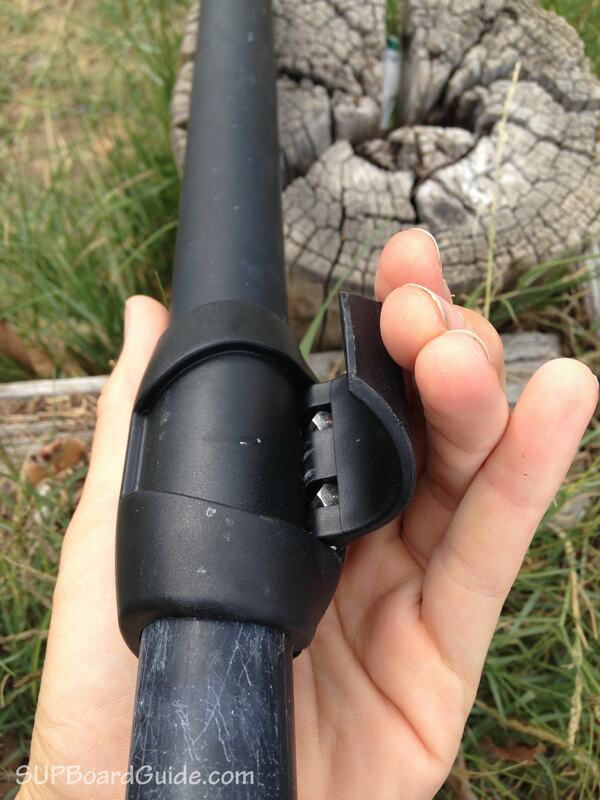 Simple twist and lock to attach the hose and pump away to 15 psi! I had it done in about 7-8 mins. After I had been jumping around and standing on my head, I felt as if the centered weight was making the board flex a little. So I pumped it further to 17 PSI, and the flex was gone. Being capable of going to 26 PSI, the Explore can be pumped to the extremes if you feel you need it. You should be fine at the 15 PSI mark though. Deflating simple push the lock-in and turn, then roll around the board like a worm after the rain. It helps to picture this, it definitely makes the deflation quicker. 10/10. It’s one of the lightest inflatable SUP’s available (that doesn’t sacrifice quality for it), and it comes with a backpack. The backpack is also ultra comfortable and features full support. On the board itself you can find handles in the center and at the tail which both have a material covering and comfortable to use. From the moment I had the paddle in my hands, I knew I was going to love it. The paddle pulls apart into three pieces and stores conveniently inside your bag. It’s made from a mix of plastic and fiberglass, making it extremely light but still durable. I like the matte finish, it felt very smooth in my hands. I did find one of the locks needed to be tightened, but that’s a pretty standard thing to happen, especially straight after shipping. Gripping is easy and won’t blister with the rubber edging around the handle, helps keep everything paddling smoothly when you get wet too. Adjusting the height of the paddle was super simple with a click lock action, that doesn’t jam or stiffen. You can really feel the difference in this paddle compared to the mid-range included paddles you’ll normally get. Adjustable heights are from 220 cm to 230cm. As I propelled through the water, the paddle held steady, and I hardly felt any flutter, even with the chop. This will help you if you are a beginner, as it adds to your balance! Not to mention if the first time you’re paddling, you feel like a pro, you’ll want to keep going! One thing I don’t like as much about the click-lock on the paddle as opposed to the pin-lock is that you can get it wrong. I was on the water and swapped my surfboard to go on the SUP. I then had to adjust the handle. As I was a little wobbly already being on the water, I clicked the pole in on the wrong angle a few times. I could tell because the handle wasn’t horizontal. A very small issue for what else is one of the better paddles you get with boards. If you do ever feel like upgrading your paddle I’d recommend checking out the Hornet Jaws. It’s a high-end carbon paddle you wiull absolutely love. Another favorite accessory of mine is the coiled leash. The coiled leashes stretch further and are stronger. Many SUPs don’t include the leash, probably to help keep costs down, but, it’s imperative for your safety. For the small extra amount, it’s worth it to have a few as well. If you forget to swap leashes over on your SUPs and drive an hour out to the river..well, you’ll be pretty upset. Oh and there’s a secret stash spot for your keys! So, some companies like Tower argue a backpack is just a luxury item. Personally, I think moving an inflatable SUP without some sort of bag is a horrendous task. Especially bringing the gear with you too. If you are able to drive up and park next to the water, no problem! However, if you are walking in for five mins through some bushland, up and down, like me..you want a bag and a good one at it too. Other backpacks I’ve tried out before, the placement of the straps is off. Additionally, the materials are thin so you feel everything poking at you. Bay Sports bag is similar to a hiking bagpack. So much padding for comfort and support in the right places through the shoulders. I also noticed there was plenty of room for the board and all the gear, which made the pack and unpack easy. It has multiple handles on the bag for easy lifting/transport in and out of the car and cinching straps inside for the OCD packer. No, not really, they are extremely helpful in keeping an even weight distribution when walking. 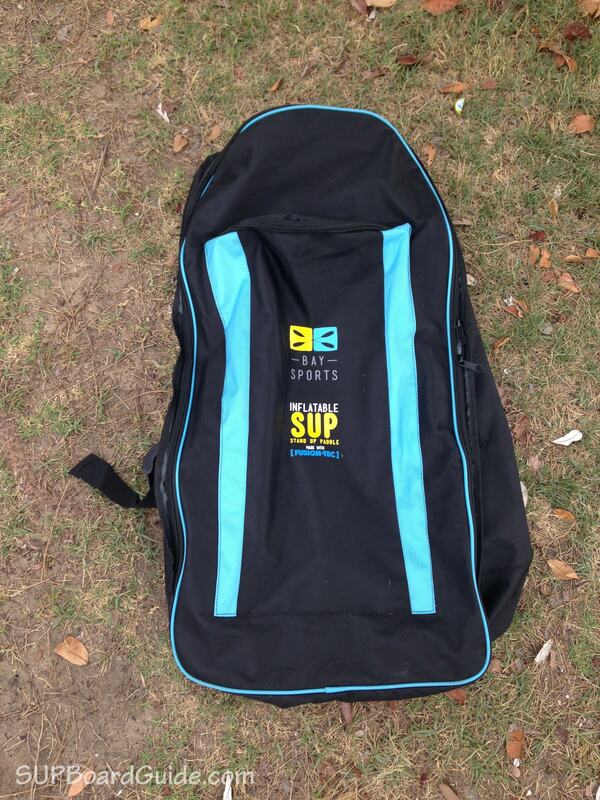 Sometimes you’ve got to pack your SUP up wet, and that’s fine too because this bag breathes! It has mesh sides which help keep that wet SUP stank away. As the fins are molded plastic, they can bend out of shape easily. It’s also simple to bend them back into shape but having these little inflatable fin protectors helps minimize that effort. 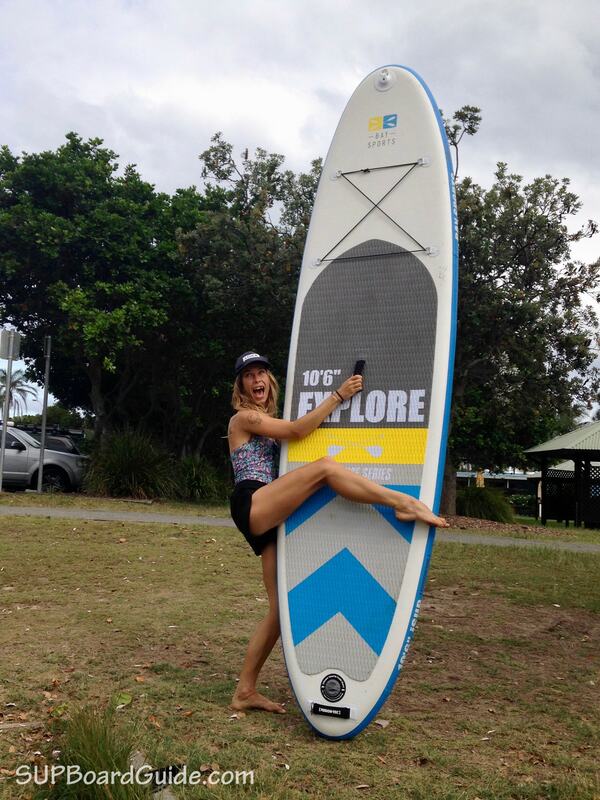 If you lucky enough to not need to deflate your SUP everytime, then they are also an ideal option for safe storage. Or you can wear them as floaties! On the board there are 4 D-rings in the middle, they are for attaching the optional purchase of a kayak seat. Its angle is adjustable for your torso-leg ratio needs and straightforward to assemble. For beginners, you may feel the urge to look at SUP’s around the $500 mark. Don’t be a sad sally and give me the pleasure of saying “told you so” by skimping on reasonable materials if you’re after a SUP that will last. If you’ve got the extra to spend, you are spending wisely. If you don’t, it’s worth waiting until you do. The materials, the accessories, the manufacturing, the customer service..oh the customer service!! The guys at Bay Sports make it really hard for you to not buy something. They also have an innovative range of kayaks including a see-through kayak. You can watch all the fishies go by! They back all their products, with a 2-year warranty and 30-day free return policy. Their reviews glitter with remarks of customer service that was once thought a myth. You’ll be hard-pressed to find boards in the high-quality range at a reasonable cost with such superb customer service. So, go check them out, drop them a line! 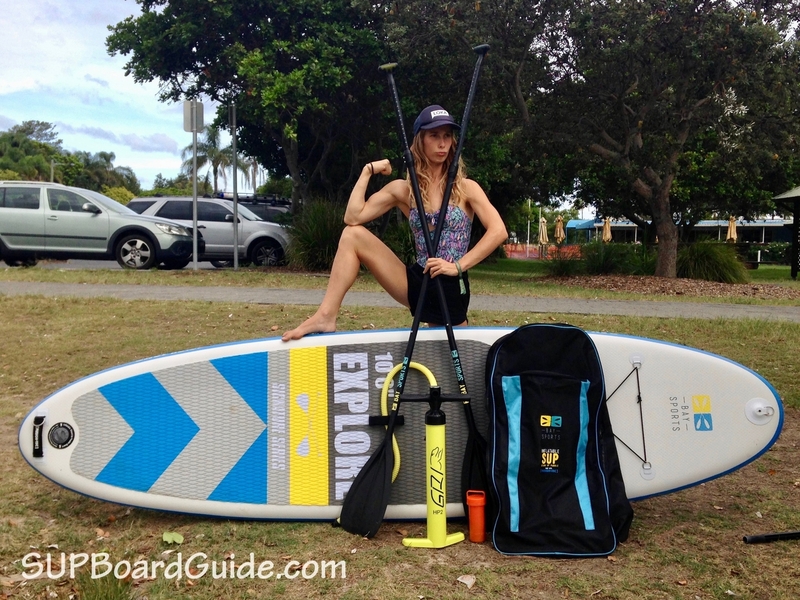 Hi – I’m interested to know how this compares to the The Red Paddle Co Ride 10’6″ as reviewed in the “Three best inflatable Stand Up Paddle Boards” article from January. 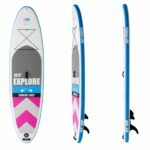 My wife and I are beginner SUP users, looking for our first boards and torn between the Bay Sports Explore and the Red Paddle Co Ride. We are larger folk (she 80kg, me 100kg) and intend to use mainly for touring on inland waters in South East Australia. both are great boards. The Red is definitely one of the highest quality boards you can get but it does come with a higher price tag. You get the Titan pump which is awesome and the overall quality is really high. It is slightly stiffer than the Explore but that’s something you’d mostly notice in the surf. For inland touring, I’d prefer the Explore. The reason is that the Red has a thruster fin setup. That setup is good for all-around boards and great for the surf but not really fantastic for tracking. The Explore comes with the US Air Fin Box which is really the best option you could ask for since it allows you to easily swap out fins. Especially as a beginner, you will appreciate a large center fin for tracking. Also keep in mind that the Red does not come with a paddle. I was in the exact same position comparing the red paddle co 10’6 and Bay Sports 10’6, both looked high quality. 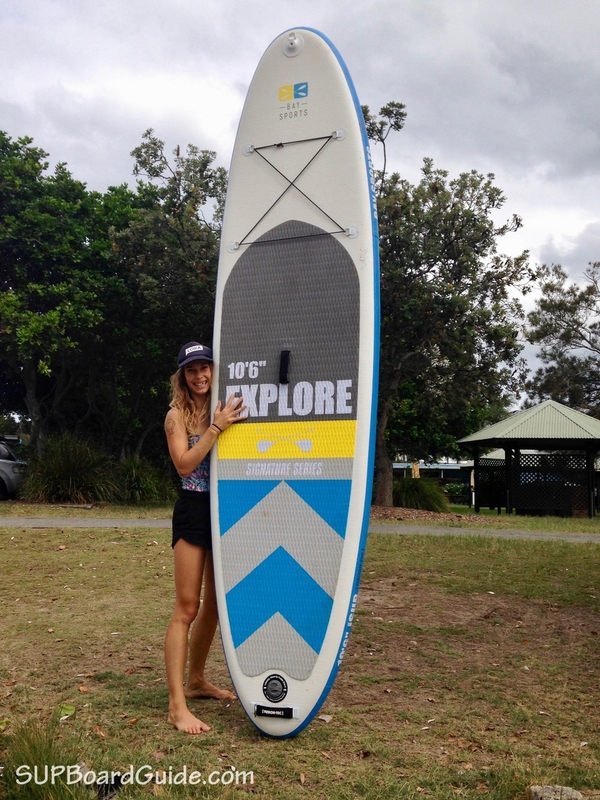 I was able to rent them from Manly Kayak Centre and i found that the bigger center fin on the Bay Sports 10’6 gave the board much better stability, (like it acted as a keel) and also tracked noticeably better than the red paddle co thruster fin set up. In the end i bought the Bay Sports 10’6 as it represented better value and i thought the stability was better. Hope that helps, PS loving the board!